Checkout our nice-to-have selection of 10 homeware pieces that will bring luxury touches in your interior design for 2017. Fine, Chic, classy! 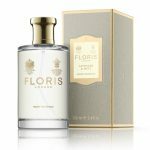 From favourites, Floris of London this room fragrance combines top notes of citrus and mint with base notes of patchouli, musk and moss. 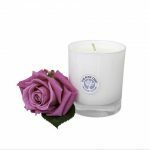 Inspired by “dear old Ivy Lodge”, the Floris family home for over 50 years it is a simple and effective way to create a subtly fragrant atmosphere for your home. This candle gives a great calming atmosphere to any room. Totally soothing ylang-ylang is coupled with geranium that will take you back to summer. What’s more is does not contain any chemicals or artificial scents. It will keep your house calm for 45 hours. 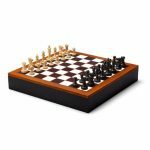 Great for chess lovers, this is the very best chess set you can buy. This magnificent set is based on the renowned Staunton design chessmen (originally designed in 1849). The boxwood weighted chessmen, handmade in India are flawlessly hand carved from the perfect turrets on the castle to the smallest details of the feathered knight’s mane. Make all your opponents jealous! 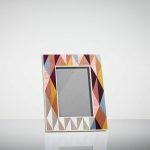 A contemporary sycamore photo frame with marquetry inlay it’s beautiful complimentary colours will add a pop of colour to any room. Hand made, these are utterly unique – no two pieces are the same. 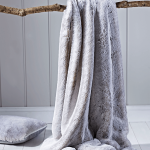 Homeware favourites Cox & Cox have brought out a new colourway, Silver Rabbit for their ever so popular faux fur throw. Super sumptuous it will make you want to curl up. 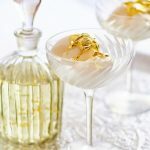 Classic and elegant, this range of hand-cut crystal bring extra sparkle to any dinner party. These beautiful glasses are 24% lead crystal, which is what makes them really twinkle. 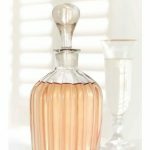 Team the coupes with this beautiful statement decanter. Use it to serve and store your favourite spirits, fill it with scented oils for the bath or keep by your bedside. 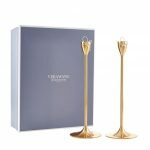 This candle holder set from Vera Wang for Wedgwood brings ambience and warmth to your home. Plated in silver with a gold-tone finish and complete with charming sterling bows, they’re an unstated piece for the centre of your table. 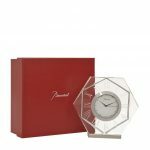 Crystal specialists, dress your desk or mantelpiece with this exquisite Harcourt Abysse clock from Baccarat. Designed by Thomas Bastide and handcrafted in France from luxurious crystal, the hexagonal translucent silhouette is filled with contemporary appeal while the roman numerals give the piece a traditional yet timeless feel. 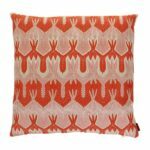 This Ormond cushion by Missoni Home features a lace effect design in a jacquard weave, in shades of orange, perfect for adding a touch of luxury to a sofa or bed. Combine this Missoni Home cushion with complementing soft furnishings for a fashion forward interior style. Made in Italy.